ADAMS, John Quincy. 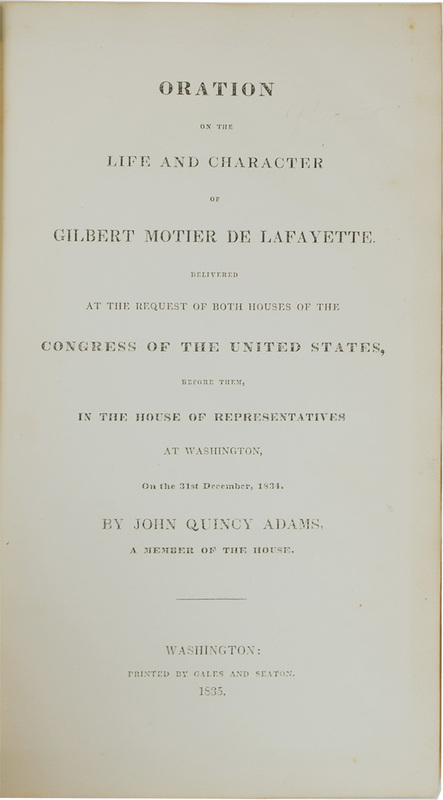 Oration on the Life and Character of Gilbert Motier De Lafayette. Delivered at the Request of Both Houses of the United States, Before Them, in the House of Representatives at Washington. On the 31st of December, 1834. Washington: Gales and Seaton , 1835. First edition, thick-paper copy. Inscribed by Adams on an inserted slip in front of title-page, as usual. 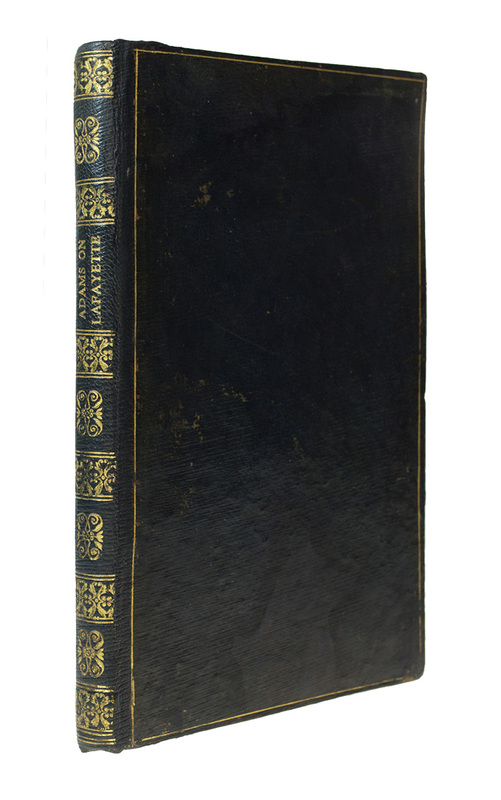 Signed "Ebenezer Jackson/ from/ John Quincy Adams" Octavo (8 1/2 x 5 1/4 inches; 216 x 134 mm). -94, [2, blank] pp. Contemporary full straight-grain navy blue morocco, handsomely rebacked to style. Spine stamped and lettered in gilt. Boards ruled in gilt. Blue drab endpapers, original plain wrappers bound in. Pages a bit toned. Inner hinges repaired. Previous owners ink signature and address label on front free endpapers. Same owner's blind embossed notary stamp on signature sheet and page 49. Overall very good. 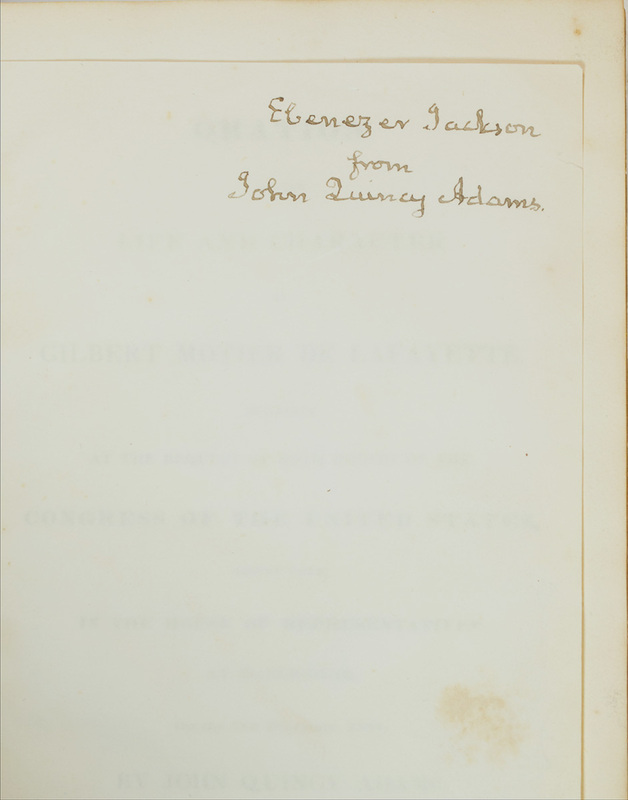 It is commonly known that at the time of the original publication of this book, John Quincy Adams was out of town, so he inscribed to friends on slips of paper that were to be inserted. Ebenezer Jackson was a member of the U.S. House of Representatives from Connecticut for the Twenty-third congress (December 1, 1834-March 3, 1835) alongside John Quincy Adams.